Squash House Quilts: Thanks for the Memories & A Winner! "Some friends made us a beautiful gingerbread house when our kids were little (2 & 3), and I proudly set it in a place on honor in the living room. Imagine my surprise when I got up the next morning and went to admire it and it was gone. Everything!! Even the cardboard it was displayed on. Then I noticed a trail of crumbs on the floor. I began to follow them and they led to the bathroom trash where I found only the cardboard and the paper cones that *had* been icing covered trees. My adorable children had been in bed when the gift arrived, gotten up and found it, and had eaten it all up!!! " Here is a photo of our small (5 1/2 feet) tree downstairs. There isn't much daylight in this corner, so it was hard to get a good shot. I love this little tree - all the decorations are nature-inspired and either gold or coppery colored. I used to have them on a feather tree in the bedroom - that tree was just never Mr. Squash's cup of tea (wink). Now I really like these decoration on pine - much to Mr. Squash's relief! I'll be back in a few days. Still trying to round up before and after photos of our Squash House transformation as promised - turns out they aren't all saved in the same spot! Congratulations Chris, thanks for the lovely memory. Congratulations to the lucky winner. We have one tree...since I do not like doing the decorating of it...I leave it to Mr. Creations. I do love looking at all of the decorations. Your tree is beautiful. I love Chris's story, sounds like my house!!! Congrats to Chris, what a fun memory!!! Chris's story gave me a good chuckle! Your Christmas trees are very pretty. Merry Christmas! I'm so excited I won! Thank you. And thanks to all the ladies who offered their congratulations! 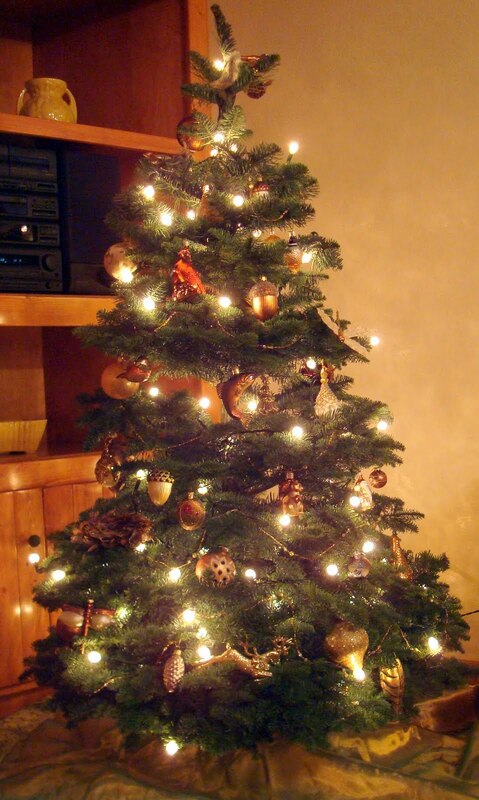 Your Christmas tree is gorgeous, Candace! Beautiful ornaments! Nice tree. Congrats to the big winner! Chris is such a deserving winner. She's a sweetheart. So happy for her.